Plan? There was a PLAN? Brr! Baby It’s cold out side! The final, fussy details haven’t been started—but the socks part has been completed. The last pattern row was done listening to Franklin Habit yesterday at KnittyCity—He was there as part of his book tour for It Itches. There was a pretty big turn out--(50 or so knitters). I was there with about half of the Sunday at Panera’s (West Babylon) crew. I finished up the toes of the socks last knitwhen I got home. Today will start with the Oak leaf for the back –The acorns will be the last things knit..
And all of this before the 1st!--That's the deadline I've established for these socks..
As for my list of things I want to, I plan to, knit grows exponentially! The (proposed) pink silk scarf? Its being pushed to the back burner. My daughter Emily is participating in the Avon Walk for breast cancer research, (you can find her team page here)—and I’ve committed to making some prizes for a fund raising event she is planning—Obviously, one of the prizes will be a pair of Think Pink socks. I have some rose sock yarn and some Lion Brand pink sock yarn, and some white yarn (and pink dye) and some cottony pink sock yarn (a gift from Lisa) and –if push comes to shove—I have already knit (but never worn!) a pair of sock made with Patons Stretch sock yarn (in pink)—for a color that is one my least favorites—I sure do have a lot of it! This photo is on the Number 3 train(on the way home) Liz, Lisa and Amy (and Rena's arm in the peach)--3 member of the West Babylon Panera group--and to the left was the most bewildered looking man. He was totally entranced (intreged?) by the idea of some one using a drop spindle on the subway! If you had 100, no 1000, words to describe me, Stealthy wouldn’t likely make the list. But that’s what I have been—stealthy! I am working on stealth project. And between a social life (and a not so social life with my car in for repairs!) and making some jewelry, and picking up my car*, and stealth knitting I haven’t had too much blog fodder. But I have been working on my Mast socks-- which are rapidly approaching the toe. Did I mention? Mast is a term for acorns, and other edible fruit and nuts that lie in the leaf litter of a forest floor. The design on the front of the sock is an acorn lace. There will be some finishing work after that—a leaf (or rather a pair of knit leaves) and a pair of acorns for the back of the sock—and some weaving in—contrasting color trim for the cast on’s, and the heel and toes makes for ends to weave in. It’s perfect timing! These socks will be finished just in time to not be worn. But then, I never wear newly knit socks immediately. Do you? I like to be able to admire the pristine beauty of a FO for a while before it is worn. First off, they were soft colors –spring like and with a snow drop motif, they were appropriate for mid march. And secondly, they were a treat—something special for another wise grey cold rainy spring --officially, but not in any other way! -- day. Mast will be finished this month, and put aside till a nice cool day, with winds and rain, and dreariness—the days of fall we don’t like to think about—and they will be my fall foliage colors for the day. And between now and then, they'll be petted and admired, and kept from sweat feet and stinky shoes! I learned to knit from knitters, not from books. If you learned from a knitter, by watching, then all that was offered was a word or two—or at least that was my experience. (You were expected to look at the X, and figure out that X was a multiple of 4 +2, so you'd start and end the ribbing with K2 (on right side) and start and end the ribbing with P2 on wrong side. NO ONE would spell that out! The directions PRESUMED you knew enough to use SSK's and K2tog’s, and that you KNEW to make the decreases 1 or 2 stitches in from the edge. And you would know such details—because you would have seen them incorporated into all the knitting around you. Same goes for the style you would have learned to knit in. Chances were, 100 (or even 50 years ago) all, or most of the people you knew and associated with, came from the same cultural background as you and your parents. And every one learned to knit in the same style, and to use the same cast on. When I taught myself to knit, and started holding the yarn in my left hand –it was a sort of heresy to my mother. An Aunt, Gus—(short for Augusta) assured my mother, it was OK –She was German, and knit Continental. But then she looked at how I knit—and she too was appalled. I flick my left finger to make stitches; I don’t move the needle the proper continental way! (Worse, I knit combo—and just learned to “play it as it lays’ when it comes to my knitting. 100 years ago, you learned to knit (and to cook, and to sew, and to…) without books—though even a hundred years ago, things had begun to change. You learned to do all these things the same way your mother, and grandmother and aunts did them. If you were middle class, you might have some needlework books that provided you with some ideas and directions for new patterns or stitches. But most of what you knit would have been the same as what your grandmother and great grand mother, and her grandmother, before her, knit. And you’d knit in the same style—what ever the style was. Before my parents (both working class residents of Dublin) immigrated to NYC neither had ever cooked or eaten rice, nor most forms of pasta. My mother knew wheat, oatmeal and barley—rye was exotic flour. My father, who worked in a grocery store got exposed to a greater variety of foods, --and was an adventurous eater.. He made sure we kids got exposed to a wide range of foods. When it came to knitting, my mother was a fantastic FAST knitter. She knew 2 ways to cast on—her basic cast on was ‘thumb’—the English version of working a long tail (vs. the “sling shot” American method) and the knit cast on. She knew one way to KNIT (her way, the proper way!) –even if she did grudgingly allow that her sister in law Gus knit a different way—but then she and Gus knit very different things—Gus was more cultured, (and had grown up middle, not working class) and Gus knit for the pleasure of it—my mother knit so we kids would have warm sweaters, hats, scarves and gloves—for many years, knitting was done from need, not desire. It’s not too different from cooking. People learned to cook at home, from their mother and grandmother, and aunts. And they cooked the same food that they had always cooked; in the same way they had always cooked them. Things changed—especially with the industrial revolution--with new stoves, and other new equipment, with high speed transportation, moving once exotic food to market in even the smallest town. There were new lands to explore, new opportunities to take advantage of, there were wars and destruction to get away from. Today, both knitters and cooks (especially younger, hipper, more computer literate knitters!) have learned to knit and to cook from books, on-line material, and youtubes. I am a knitter on the cusp—I grew up in a community of knitters, and learned much about knitting by observation. Then grew into a community of knitters who learned much of what they knew from authorities, from books, from magazines, from structured classes –and the same goes for my cooking. I learned the basics from my mother—and from Julia Child! So how did you learn to knit? From a community of knitter, many of them female relatives? Or from a book, filled with technical information? In the end, the Knitting is the same—or is it? It seems most knitters, (not all!) are crafty and creative in a lot of ways, and knitting is just another creative outlet. Some times Knitting their main creative outlet, sometimes its an adjunct..
Me? I’ve tried almost everything on the list. (some I can do--(well), some I can do (just) and some—well—my woodworking is 1000 times better than it was, but any one who took shop in HS, or JHS and passes is likely to be more skillful than I am! I am not very good, so I don’t do it often.Since I don’t do it often, I don’t own a lot (or the right) tools. With out the right tools, I don’t do wood work often. I’ve made simple jewelry for years. Really, stringing beads is child’s play—from flower (peace) beaded necklaces in the 1960’s—to knotted pearl necklaces–some jewelry making is really very simple. But I’ve done more complex things,--beaded broaches, and even some fine jewely –buying gemstones, and mounting them in rings and sterling silver earing backs. In recent years, I’ve also made some earings—for me, fancy one. Wires, and finding, and beads—using pliers and cutters and some skill. I must admit, I learned a lot just watching Susan—of Sulu-Design. This week, the sock is making slow progress—I get a full 4 rounds worked on both socks on my subway ride home.. (and sometimes a few rounds done at work) –but Sunday and last evening, instead of knitting, I’ve been making earing.. This collection is going to my daughter. And I have a dozen or so new pairs--some almost identical to pairs I made for my daughter, some completely different. Tonight is the LIC knitting group--and tomorrow I'll be making more earings, --Pink ones--and a pink bag(or two!) --as raffle prizes. My daughter is signing up for the Avon Walk to support breast cancer research/support. I'll be supplying some 'think pink' things for her to use for fund raising--and I'll knit some things too. Some one asked me: What is the best cast on for my project? And I answered them with questions. The best cast on for a toe up sock is NOT the best cast on for a cuff down one. The best cast on for a shawl knit in the round is not the best cast on for a scarf knit from the short edge. The best cast on for a hem of sweater is not the best cast on for cuff, not is it the best cast on for the neck edge. How do I know what the best cast on is?--How can you know what the best cast on is? Well some thoughts--what is needed from the cast on? Stretch? Or Strength? Or Both? Utility? Or Decorative? Or Both? Firmness? Or Flexibly? Or Both? Or something that will be seamed—a garment, or bag? When a knit item has open edges –be it a face cloth, or place mat or a luxury shawl, I like to think of the cast on as step1/edge 1 of the item. The cast on doesn't stand alone, but is one edge of a whole cloth. The cast on needs to be part of the selvage, and the cast off. When a cast on frames the face (a hat, or neckline of a top down sweater) it needs to be attractive. When a cast on is for a cuff, or hem of sweater, it needs to be firm (so as to not stretch out) but stretchy (no one looks good with a tight hem cutting into their hips) and durable (especial for cuffs) –and for the cuffs, attractive is nice too! That is a lot to ask from a cast on! Is is possible to go your entire knitting life using a single cast on? 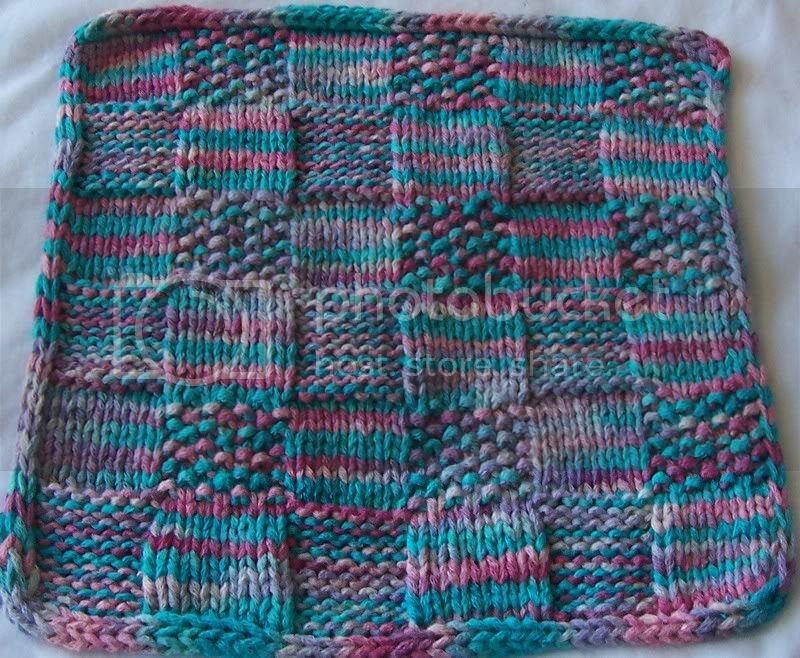 Sure—As Sally Melville demonstrated with The Knit Stitch—you can knit a lot of very different things, with just the knit stitch. If you are happy with just knowing and using 1 cast on, it's fine. Knowing, and being picky about cast on edges is just that BEING PICKY. There is no right cast on, and no wrong cast on. There is only persnickety detailing. The choice of which cast on to use, is a personal choice. How can you know which cast on to use when? Knitting a swatch? Swatch a new cast on! Making a face or wash cloth? Plan the cast on, selvage and cast off to coordinate. This example has an I-cord cast on, with I-cord edges, and an I-cord bind off. Make your next pair of socks Toe UP –(if you normally knit cuff down) and try an invisible cast on like figure 8, Turkish (aka eastern) or Judy's Magic Cast On. Or make your next pair of sock Cuff Down, and start with a Channel island cast on, or a Latvian cast on, or tubular cast on instead of the basic long tail or German (aka Twist or Norwegian) cast on. Make some Hats—(I have for the past few months!) and experiment to find the cast on you like best with ribbing.. or the one you like best for a top down hat, or the one you find prettiest, or stretchiest, or easiest! I KNOW what I like. I chose a cast on. And I always chose the best one. But which cast on is Best for you? I dunno! May I suggest the Equinox Springs? Delightful place! Speaking of traveling—I am slightly obsessed with travel mugs.A travel mug is a simple thing—a thermos like vessel for transporting liquids. It should open and close relatively easily. When closed, it shouldn’t leak. It should do a reasonable job keeping hot liquids hot, and cold ones cold. It should be break resistant. It should carry a good amount of liquid—16 oz at a minimum, 20 oz better. I ask you-- are any of those characteristics unreasonable? But go try and find a travel mug that has all of them. I’ve been looking (and purchasing , and returning) mugs now for a month-searching for the perfect mug. First –and to me-- the most important characteristic, is, IT SHOULDN’T LEAK. idea of lid is to prevent leaks. This-- from a Farberware labeled coffee mug -- is fine example of the slide and leak lid. It’s easy to slide open and closed, but closed doesn’t make much of a differance. Put it in a cup holder, stop short, and if it tips, it drips. Carelessly toss it in a tote bag, and everything in the bag will get soggy. Why bother with a travel mug if doesn’t travel well? Are there designs that don’t leak? YES. This was, for years, my travel mug –somehow, last month, somewhere, I lost the screw on lid. It was made by Trudeau and it worked. Foolishly, I didn’t immediately buy a back up! It held about 20 oz, it had an easy to clean and screw on lid that sealed tight. It did require 2 hands to open/close the lid, and it was a single side sip –(designed for a right hand hold) –but it was easy to grab with the left hand (the handle was open enough not to bang your knuckles ) and the cup itself was comfortable in hand. It's dented, (it's about 10 years old!) but its held up. So when I lost the lid, I went searching for the same mug—and of course, couldn’t find it! It had a totally different seal than my original mug.It was easier to open, and easier to close (and it didn’t leak!) It has 2 lips (for right or left handed drinking. But it is smaller --it only holds about 16 ounces. And the Lid? Well it doesn’t leak, but it also doesn’t open well. When fully open, it lets liquid dribble out (just slightly faster then slide and leak does closed!) –Want a slug of coffee? Forget it. Tip it to your mouth, and it will slowly dribble out a mouthful. So—while it didn’t leak, it wasn’t perfect. Next the Oxo design—the LiquiSeal Travel mug. This mug is near perfect. Second, it opens fully and drinking from it is like drinking from a cup. Third, it has single handed open/close mechanism. Its handleless design makes it good for righthanded or left handed use. --but its small—it holds just 13 ounces. And it’s all plastic--and lets face it, drop it a few times, and the plastic will crack--and plastic cups are just not as effective at keeping hot beverage hot, and cold ones cold—the Oxo home page shows this mug in stainless steel as well as the plastic design, but it too, is only 13 ounces.. and well.. too much money for too few ounces. So when I saw this Michael Graves design in Target, that was bigger, and metal, and sported a very similar design on the lid as the OXO. -I thought—I’ve hit the jack pot. The inside of the lid has this dome like cover (making a bit harder to clean) but that didn’t matter—what mattered was –the parts didn’t make a tight seal! Unlike the similar looking OXO design, It leaks! The flow of liquid is only slightly less when the lid is ‘closed’ than when its open!–it’s a good design done poorly! and the coffee maker by the same designer seems to have problems too.. The search was still on. Another contender is the Copco cup. Copco make several styles of travel mugs--including ones with a slide and leak lids. But this Copco lid caught my eye--it has a hinged flap that can be flipped open or closed (it’s easy to open single handed, but a bit harder to close (completely –that is-- leak proof-ly!) single handed. But --it leaks less than any other design when not fully sealed—and with a two handed close to the lid, is perfectly leak proof. It has a comfortable grip, and insulates well—the stainless steel interior and exterior is easy to clean, and while they might dent, they are durable. The design has one flaw. The small air hole is too close to the drink opening. These examples pretty much exhaust the local selection—none are perfect, though a few are acceptable. Most of these designs are available on line from various sources. Often the on line descriptions and detail are sparse. I remember having an idea for an interesting shape to the heel –and I also remember, the first go at it didn’t work, and that I frogged back a few rounds and started again. But what ever the plan was-- It's been lost to the mists of time. This go at the sock, the plan is: Complete it! There are 1 and half repeats of the pattern on the front, and as a result, Row 1 has 6 extra stitches—when compared to row 8. These stitches, plus the 6 stitches in the gusset, create 12 stitches/1.5 inches of ease a the point of the heel! –Enough to make a difference (a pleasant difference!) in the fit. It’s a perfectly plain heel—worked in the same contrasting color as the I-cord. The I-cord cast on, at the top of the cuff will, (at the top end) have an 3D acorn dangling, and at the bottom, an oak leaf. Maybe, if I feel ambitious, I’ll duplicate stitch another acorn on the center back of the heel. But I doubt it—I do wear open back shoes (burk like stuff) but less in the winter than the summer. If the heel going to be hidden in shoe, why bother? The toe’s will be the same solid contrasting color... which will leave me a big chunk of the striped yarn left over –even with the relatively scant yardage of the Kroy Stripes (166 yards!) but I have some solid brown (Calzetteria) that can be trimmed with the left over—eventually! PS: Do the cords of the circ’s seem curly to you? When I learned to knit, the cords on Circ’s were cables.. metal cables not too different than piano wire! When super stiff cables like that are your starting point, a kink or two is nothing! I started out with somewhat straighter cords, but 3 months of being stuffed into a small project bag did a number on them! I took a few days off--from knitting and from blogging. Well--Completed—(more than a week past!) are my little lacy fingerless gloves. And lots of wool left over for a matching cowl –(and some zepher for a nice lace edging on the same) But not now--my mental queue has lots of things to keep me busy--and besides--spring is at hand. And a Hat—No, it’s not number 18—this hat is for Ernest--a dear man, who has worn the red fun fur hat his girlfriend crocheted for him on occations, but who deserves better. This is Mode Dea’s Silk and Wool—a blend of 15% silk and a soft wool. Ernest is a typical NYer—and a good 90% of his wardrobe is black or grey (charcoal and lighter grey. The photo makes this dark grey look like a multi color tweed, but its really a simple dark grey. So it will match almost everything he owns! On Sunday, I started ball 2 of Patons Bamboo Silk, which ran out just about dead center of a pearl (obviously the center pearl!) of the Black Pearl scarf. Since then, I’ve gotten another pearl knit. Not much progress. But this is a fun scarf—it's especially fun to knit in public—(it elicits all sorts of comments!) and I have mentally committed to finishing this before starting anything else. My “at work and subway” knitting is the Mast socks. Remember them? No? No wonder—they have been pending—half knit--since December. Very autumnal, and spring is at hand… So I better finish them soon so I can knit something more seasonal! Sock yarn is piling up.. demanding to be knit. Some --the skeins of irory, and natural-- are even demanding some color—but those noisy skeins will have to wait til after Easter, when egg dye kits are 50%! Maybe, if I am very good to Kelly (aka LICraftGal) a skein or two will end up in her pot of indigo dye later this year. Just where are those odd bits of purple silk? Maybe I can use them as an inducement! This one is just a a recap of hat 15.. in different colors..but basiclly the same hat. Braided cast on, 2 sets (each two rounds) of Latvian braid, seporated by 2 rounds of stocking knit. It's been one of those unexpectedly busy day.. so this is it! Or does it always come in spurts? Then yesterday, another from my boss, (Is that 7 from her? or 8 –a lot either way!) blues and greens. Robyn cranked out 4 in the blink of an eye! You can see them over on her blog--being modeled by Finn. Yesterday on the way home from work, I completed the last round of Latvian braid on hat number 16. My original thought was to have the body of the hat done in purple, but the green yarn asserted itself, and demanded to used. I have more yard purple and the gold than I have green.. And there is still a skein of black sitting patiently, not saying anything, but insistant just by its presence, that it be knit up. I got a dozen or so round completed at LIC knit(ters) group last night.. another dozen and it will be time for shaping. All these plain(ish) hats have my creative juices bubbling. I have an idea for fun hat—a retro cocktail hat-- (circa 1950’s) dimentional, ornate, and of course, complete with a veil. Along with the rest of the north east. This week, it’s mild. Not really warm-mid 40°(f)—(about 7° to 10°c) but the days are longer, and crocus and snow drops are still being shy—but they are there, poking up their heads. For sure, warmer days are ahead. And I am still knitting and collecting hats--but getting closer, and closer to the total. Isn’t the purple one pretty? The yarn is a Noro look alike—It’s Nashua’s Wooly Stripes (88 yards/$3). Smiley’s has it in 2 colors, and I know, I know, their high minimum purchase for those of you not in NYC makes ordering from them a drag—but its good to know about. Still it’s something to consider if you’ve thinking about a Lady Eleanor or some other entralac project that needs long color changes. Sunday, I bound off the teal fingerless gloves—Just in time not to need them! I have a huge amount of yarn left over--and a small 300 yard skein of some matching Zepher. A cowl of some sort will be appearing—maybe a mobius—a simple seed or something similar in the hand painted—with a gossamer lacy edge in the Zepher. The Black purl scarf has become my at home knitting—the newest hat—is my at work and on the subway knitting--at least for the next few days. A few weeks back, I posted about this simple hat with a braided cast on, and a Latvian braid trim. Both are fun techniques to know and use. This weekend, I made some video’s demonstrating the techniques. and Latvian Braid Part 1 and Latvian Braid part 2. I’ve done it in 3 colors --often, and in the video. But once, in a fit of insanity, I did it in 5 colors! But the same process also works with 2, 3, 4, or 5 colors--after 5 colors, the floats get too long. When you work this cast on—Work at least 1 row/round (R’s) of knits--before you start with ribbing, or continue on to work a Latvian braid. The R(‘s) of knits will cause the cast on to roll forward (remember, stocking knit rolls!) and will make the braided cast on edge more prominent. I almost always follow up a 3 color braided cast on with some Latvian braid—to me, they are natural go together--peanut butter and jelly of knitting techniques. Latvian braid is like fair isle—done wrong! One characteristic of Fair Isle are smooth, straight floats. Latvian braid is characterized by twisted floats. Fair Isle is worked in stocking knit, with the float on the inside. Latvian braid is worked in the Purl stitch (reverse stocking knit) with the float on the right side of the work. The yarns are twisted (over or under) –and this make the balls tangle and twist too. For me, 100 or so stitches (a Hat) are just about as many stitches as I can manage without being too frustrated by the twists. The braided cast on--and the Latvian braid –worked tight –is just that-- tight. But with a little care, it’s stretchy –and can even be used on the cuff of a sock! This technique is a fancy one. Use it where you can show it off-- for mittens and hats! A braided cast on followed by a Latvian braid (2 rounds of purl) then 2 rounds of knit and then another braid (2 more rounds of purl)–create a beautiful edging to any knitting. The combination of stocking knit/reverse stocking knit creates a controlled roll--that works just as well as ribbing as an edging. And you can switch.. and have the center front of a mitten >>>>>|<<<<<<. I am nominally Christian. I was raised as one, but now days; I am lapsed, and at best am a deist. Still I know about sin – and avoiding occasions of sin. But the SIn I speak of is Stash Increases. I have been working to avoid occasions of SIn. First and foremost—I’ve just made it a habit not to go into yarn stores—and if in a Michael’s or ACMoore, not to walk over to the Yarn corner of the store. I’ve even sold some of my stash, and given small bits away. The 16 hats I’ve made have made a dimple (not a dent) in my stash. My efforts have been somewhat successful. Yarn is being knit up, not pent up in stash. Then this week, I Sinned. First, Robyn shared some of her Lion Brand yarn with me. Look at this lovely sports weight, Machine washable merino. --Can you see mittens and a matching hat? I can—I keep looking at Nanette’s mittens and hats-on her blog--and thinking—I could do that. Now maybe I will do that! Three of the skeins are from Robyn stash—the 4th(the black) forced its way into my life when I went to see the Lion Brand Studio Window display on Monday. The Sock yarn, too is from her—the 3 skeins are all partially (but insignificantly) used. Not photographed is the cone (200+ yards) of the Wool and Steel yarn—(I think that is going to turn into a Retro (1950’s) style hat with a veil..) and the 2 skeins of Sasha that also forced their way into my stash on Monday! In one of those peculiarities of NYC real estate—most commercial locations don’t include heat (and often no hot water either) or AC. But now, the tenants are gone, and the heating is at the minimum (just enough to keep the pipes from bursting (I hope! )My boss has provided space heaters (7 of them! )and they are all on.At 10 am the back of the store—(far, far away from the all too constantly opening door!) was a toasty 49°. It’s is cold out. Winters is having it last BIG hurrah–right now its warmed up to 18°(f)-or about -6°(c) and there is a brisk breeze. It is a short term problem—Thursday it is expected to be near 50°--but it cold right now! So here is something that will warm the heart—if not the body.. If you live in, or are planning to visit the city--make sure you go see it! Ok, so it's late in the season for snow—and this storm is dumping more than the normal amounts--still its just snow! What is news is, last night, hat numbed 16 was finished. This is another one of those hats that just knit its self. I had a couple of false starts, and abandon it for a while. But I picked up knitting it again Saturday evening the yarn and needles had resolved what ever differences they might have had—and this hat just appeared by Sunday.